DEET, thought to be the most effective insect repellent available, may not be an insect repellent at all. It's not that DEET doesn't keep away critters—it verifiably does. However, Leslie B. Vosshall, Rockefeller's Robin Chemers Neustein Professor, has shown that DEET acts not by repelling bugs, but rather by confusing them, messing with neurons that help the animals smell their surroundings. Moreover, the effects of DEET are not limited to insects: spiders, ticks, and many other pests also act strangely in the chemical's presence. In this sense, DEET may be less of an insect repellent and more of an invertebrate confusant. The term doesn't exactly roll off the tongue, but new research from the Vosshall lab supports this rebranding of the chemical. In a recent paper, published in Nature, Vosshall and former graduate fellow Emily Dennis show that, like insects, the nematode C. elegans succumbs to confusion when DEET is around. The team also describes the genetic and cellular mechanisms underlying this response, shedding light on how a single chemical might confound the senses of vastly different species. 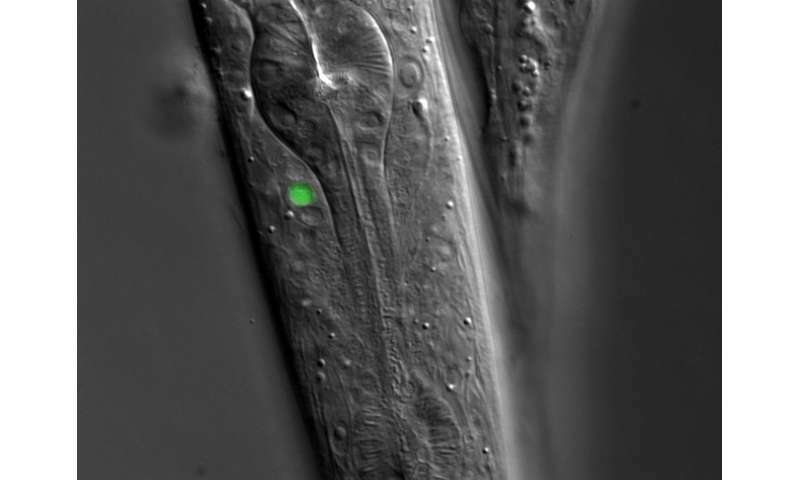 Seeking an explanation, Dennis and Vosshall teamed up with Cori Bargmann, Rockefeller's Torsten N. Wiesel Professor, to examine whether and how DEET changes the behavior of the roundworm C. elegans, a relatively simple animal with an elaborate sense of smell. When the researchers presented the tiny worms with samples of DEET alone, the animals didn't go out of their way to avoid the chemical, indicating that DEET doesn't simply repel every organism that crosses its path. The scientists then mixed small amounts of DEET into agar, the gel-like substance that C. elegans crawl on in Petri dishes. The presence of DEET limited the worms' movement toward isoamyl alcohol, a chemical that usually attracts them; it also reduced their avoidance of 2-nonanone, a compound that they typically dodge. Still, the worms reacted normally to some other chemicals. These findings suggest that DEET can interfere with responses to both "good" and "bad" smells, but that it does not entirely shut down olfaction. The researchers also found that the worms' DEET sensitivity depends on a gene called str-217, which is expressed in neurons called ADL cells. When the researchers artificially activated these neurons, the worms paused in place—a behavior also observed among C. elegans navigating DEET-infused agar. Together, these results indicate that the chemical works, in part, by turning on neurons that induce pausing. "Somehow activating ADL puts the worms into a frame of mind where they're more introspective, they're pausing more, they're not paying as much attention to odors," says Vosshall. "But if you take away the right gene or neuron, this spell is broken." Indeed, the researchers showed that worms lacking either str-217 or ADL neurons are less affected by DEET. They conclude that str-217 likely codes for a DEET receptor, and that ADL cells play an important role in mediating response to the chemical. The Vosshall lab previously demonstrated that DEET keeps mosquitoes away by interacting with odor receptors in a way that confuses the animals' sense of smell. This latest study shows that DEET causes similar confusion in C. elegans, but through entirely different mechanisms. "We went into this study thinking perhaps we'd find some magical conserved DEET receptor common to all species," says Dennis. "But we found that, in C. elegans, a completely unique gene is required for DEET response." Though the study did not lead to the discovery of a magical receptor, it nonetheless provides insight into the chemical's effectiveness across highly diverse species. "The one common theme in all of these organisms is that DEET is doing something to affect odor perception—it's like sensory system sabotage," says Vosshall. Dennis adds: "Something about DEET is really special. And I think we're just starting to uncover all the ways that it can affect different neurons, receptors, and species." Wondering if there are any DEETrimental effects? I used so much of it over the years working outside that I developed an extreme sensitivity to it. Even if I spray it on my clothes first and then put them on my skin starts to burn like fire and everywhere it makes contact turns bright red. And let me tell you, there is nothing like being the only person in a group that has sprayed down with it in an area swarming with mosquitos and becoming the buffet table. There is apparently no "herd" confusion factor associated with it as the little buggers unfortunately have no problem finding me. In case of DEET - I am all for it. It has no known carcinogenicity, nor endocrine disruption, and not much cellular toxicity. I read a lot of studies on this before using it, else I wouldn't. dudester, you likely are using it wrong. The spray is not just DEET, but alcohol and all kind of other chemicals. The combination sure makes for a burning mix. Try 98% DEET. Put a few milliliters of water (or spit if you are out) in your palm, and 5-10 drops of DEET. Wipe over the open skin area. Make sure to wash when back home. TheGhostofOtto1923, you seem to figured it, and the label says so, in small letters about plastic clothes, same thing, don't you think? As to plastic dissolving - many things do. Including acetone, which is part of your ketone cycle. Now, if you like mosquito and tick bites, good for you. What is not good for you are the diseases they can pass. How repelling happens - confusion or disgust - who cares. It doesn't harm the insects permanently..
Hmmm, this may explain the strange things happening in the White House. Has anybody sprayed DEET in the Oval Office ?